Welcome to 'Catch the Bouquet'! Australia's first discount store JUST for weddings! Whether you're a guest looking for something hot to wear or a bride looking for a million dollar dress on a shoestring budget - we're the place to start! All of our cheap wedding dresses and gowns, formal dresses and bridesmaid wear are CUSTOM MADE to your measurements by a qualified seamstress in less than 12 weeks! Do you already have an idea of your 'dream gown'? Email a picture or link to bella@catchthebouquet.com.au and I'll get an amazingly great quote on having it made for you! Check out our 'Bouquet of the Week' featuring one stunning bargain item each week. 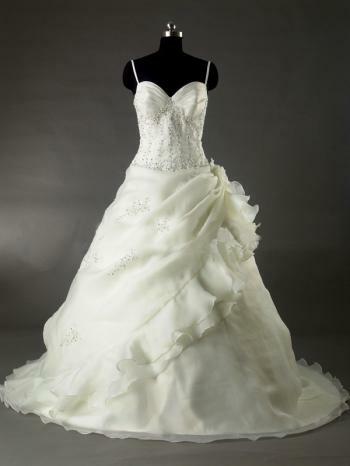 This week is is the stunning 'Emelia' gown reduced down to only $400!! We never know what the next week's Bouquet will be - but the price will definitely be right! Email Bella at bella@catchthebouquet.com.au to be added to our weekly mail-out! If you'd like a 'head's up' on the Bouquet of the Week each week, sign up to our weekly email! It could find you an absolute bargain. Please feel free to browse all our products remembering that all prices are in Australian Dollars and include GST. Registered and Insured postage within Australia is $27.50 for each dress and much much less for jewelry, depending on the amount in each order. To get an exact price for shipping, add the items to your cart - no details will be required from you to give you a shipping quote. Email bella@catchthebouquet.com.au and I'll make sure you know about the bargains before the rest of the pack! All products are available to be posted worldwide on this website. Please contact us for shipping costs to your country. To convert Australian dollars to your currency, try 'The Universal Currency Converter'. Each product has an "add to basket" option - please use this to buy securely online with PAYPAL - to pay by alternate methods, please contact us. This web site uses PayPal check out to make fast, easy, and secure payments with your credit card, debit card or bank accounts!